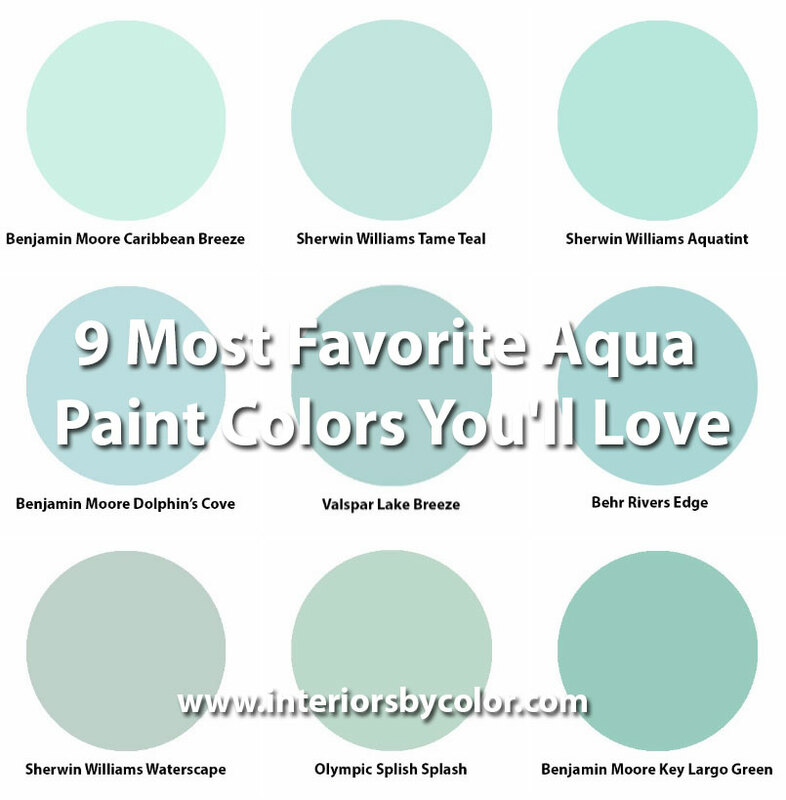 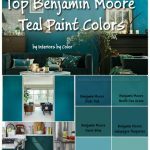 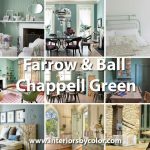 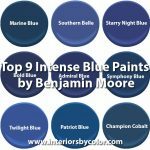 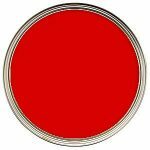 At Interiors by Color we have compiled a list of our top 9 most favorite Aqua paint colors. 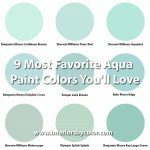 Aqua is a great choice of paint color for anyone looking for something fresh, cool and light reflecting. 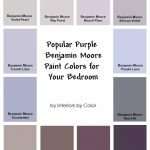 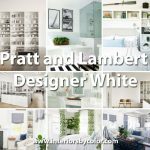 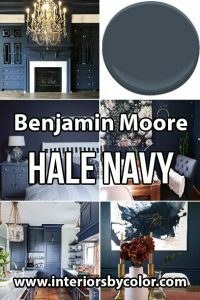 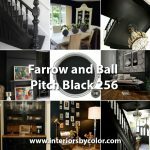 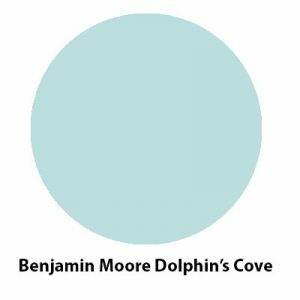 This paint color works very well in coastal themed interiors when combined with white and is also a great choice of color for a nursery, a girl or teenage girls bedroom. 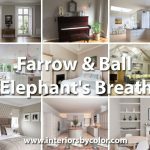 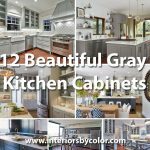 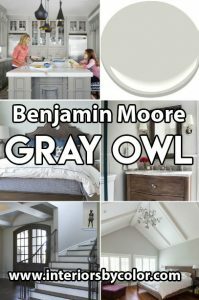 Aqua paint colors combine very harmoniously with all shades of gray and contrast nicely with bright yellows. 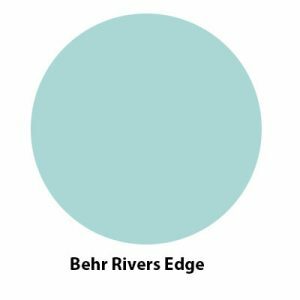 A white and aqua bathroom with white tiles, walls painted in Behr Rivers Edge 510C-3, white vanity with marble top and creamy white Roman shades. 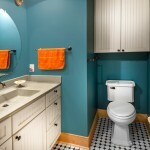 Love the freestanding bathtub. 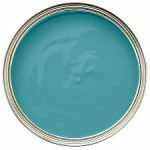 Front door painted in a stunning aqua shade "Splish Splash by Olympic". 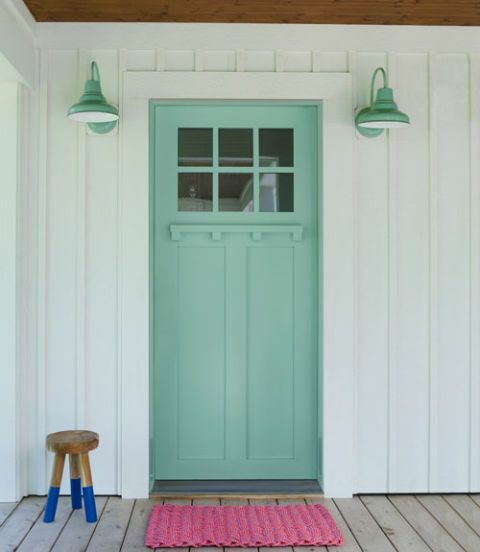 This aqua door looks great contrasted with the white painted weatherboard. 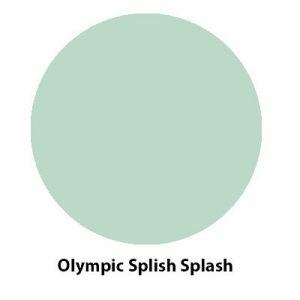 Splish Splash by Olympic front door paint color. 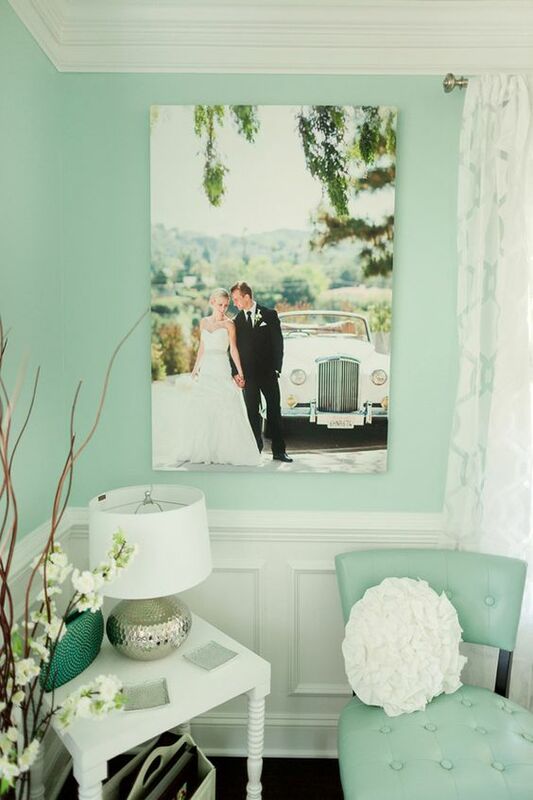 From the home office of photographer Katelyn James, an all aqua painted space, light, airy and refreshing! 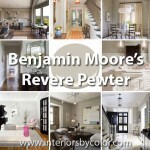 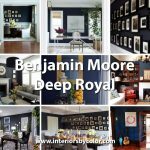 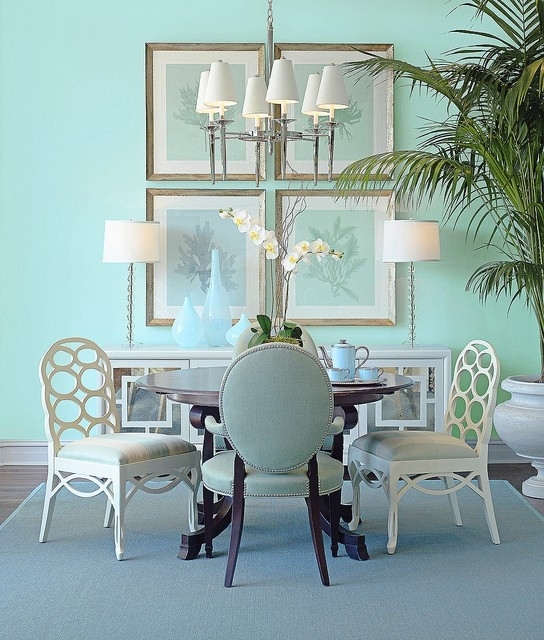 A Traditional dining room with walls painted in Benjamin Moore Dolphin’s Cove. 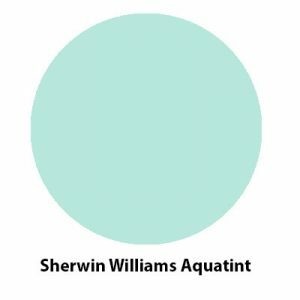 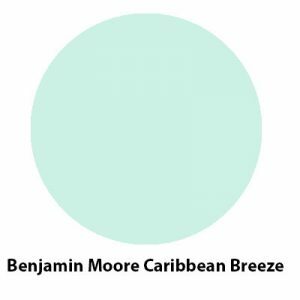 A very nice seafoam/aqua paint color; fresh and breezy, creates a beach atmosphere. 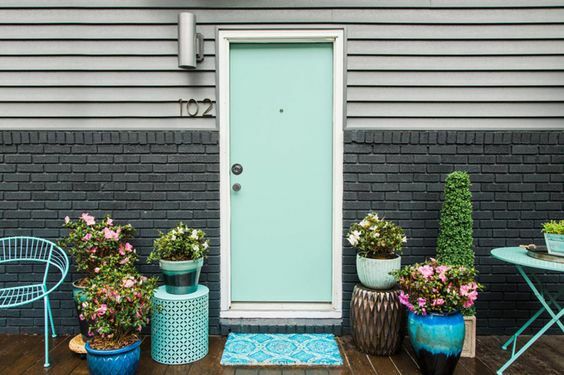 An exterior that combines aqua very nicely with different tones of gray. 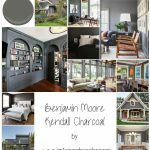 Love the door painted in Sherwin Williams Aquatint! 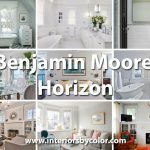 HGTV Spring House 2016 designed by Brian Patrick Flynn. 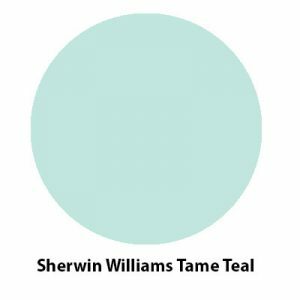 A modern, contemporary girls room with a feature wall painted in Sherwin Williams Tame Teal and decorated with golden circles. 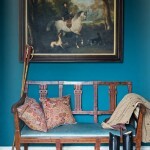 By AnaVera Design. 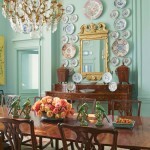 "When designing this space, I really took in the personality of this fun, funky and sweet 10 yr old girl. 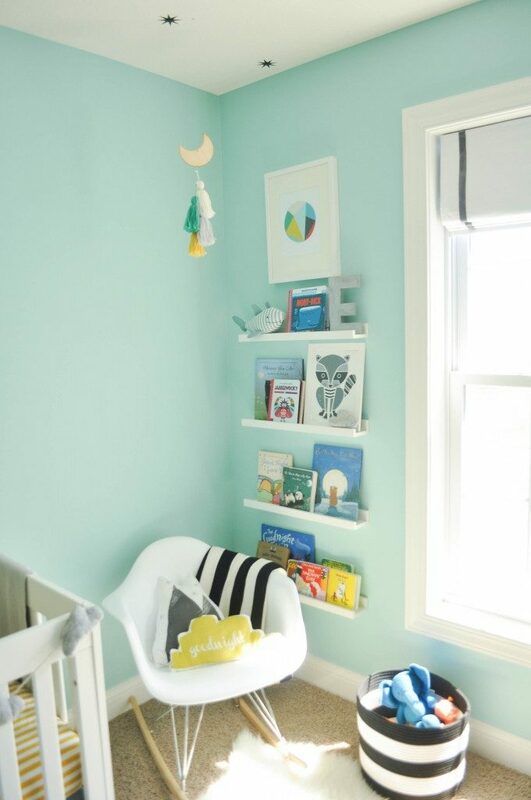 She had only one strong request, to have her favorite colors teal and gray be the main palette for her room. 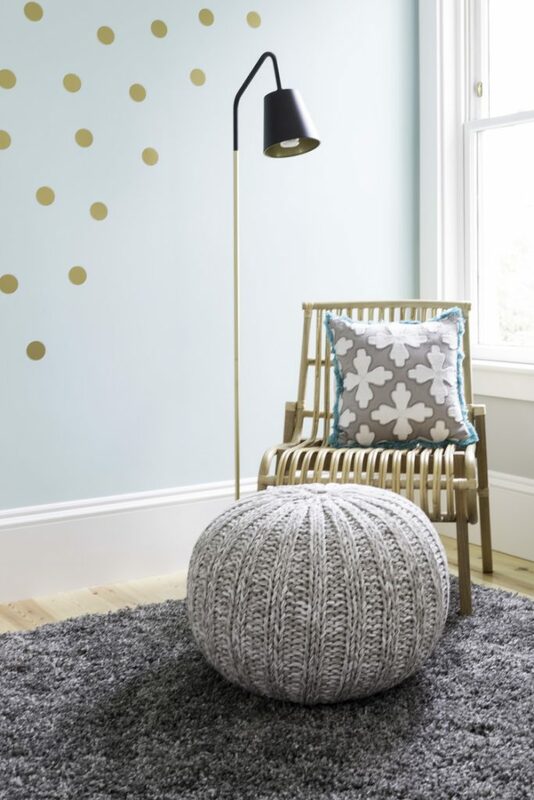 We added fun gold decals that can be easily remove to give her flexibility to grow into her space." 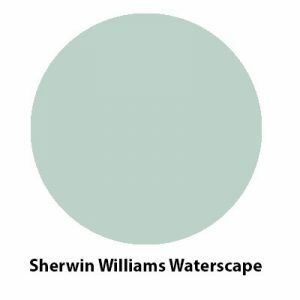 Girl's bedroom in aqua, gray, white and gold color palette with feature wall painted in Sherwin Williams Tame Teal. 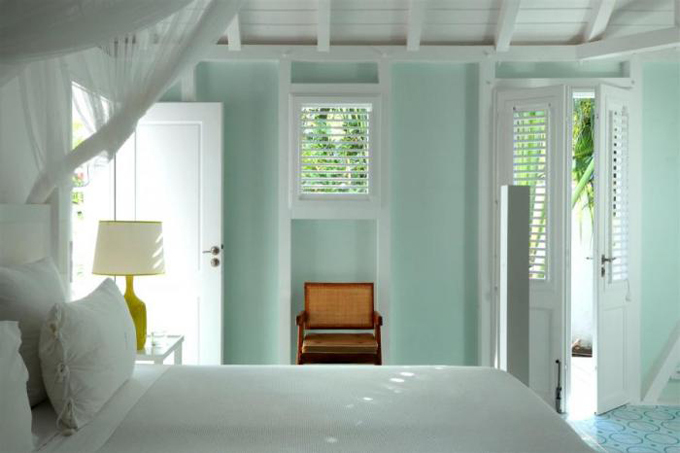 A beach/coastal style bedroom with breathtaking aqua walls painted in Benjamin Moore's Caribbean Breeze, combined beautifully with white trim. 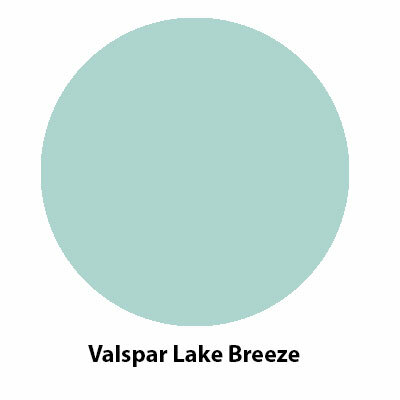 Gorgeous and tranquil baby nursery with aqua walls painted in Valspar Lake Breeze from Live the Fancy Life. 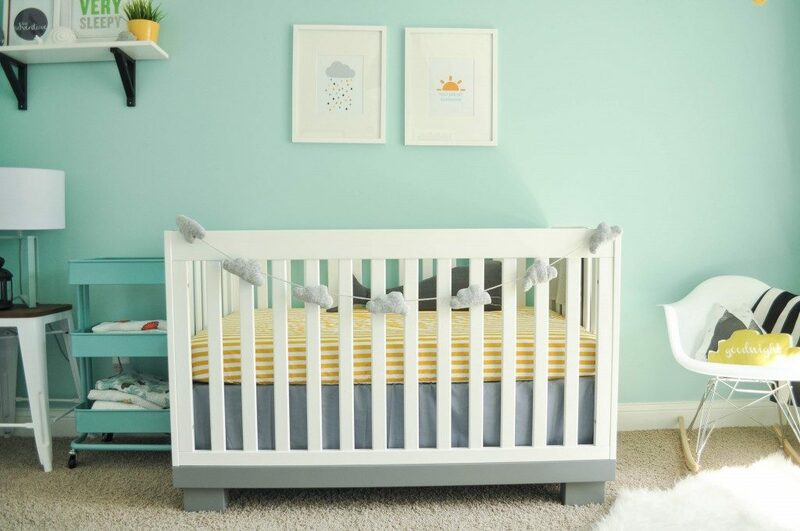 A nursery described as industrial, modern with a touch of whimsy. 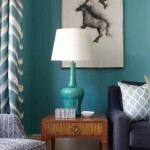 This aqua paint color looks great with yellow accents. 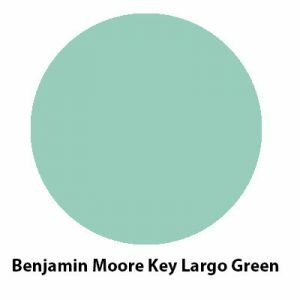 Seafoam green/aqua painted walls in Benjamin Moore Key Largo Green by Caitlin Wilson Design. 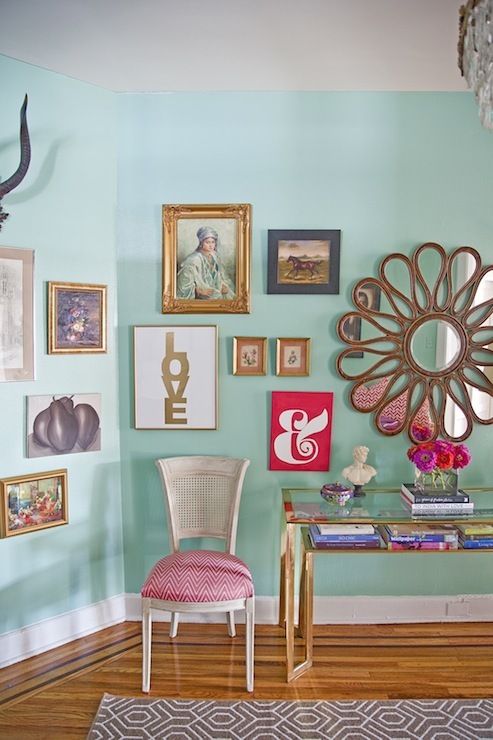 Vintage Baker console table, Made by Girl Gold LOVE print and flower mirror. 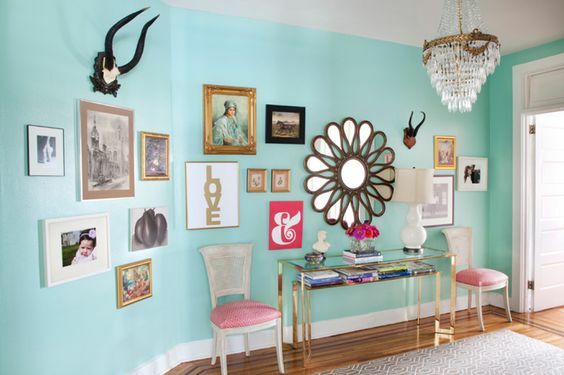 A very busy wall filled with paintings, framed photographs and mirrors.